The ruling last month forms part of Dwyer’s bid to overturn his conviction. 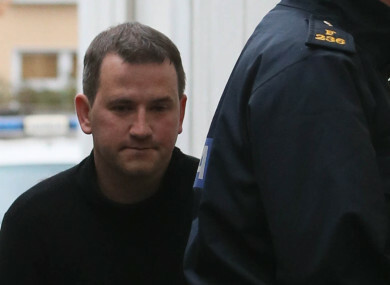 THE STATE IS to ask the Supreme Court to hear its appeal against a High Court ruling in favour of Graham Dwyer which forms part of his bid to overturn his conviction for the murder of childcare worker Elaine O’Hara. Brian Murray SC for the State told Mr Justice Tony O’Connor this morning that it intends to apply to Supreme Court to hear “a leapfrog appeal” of the finding that the Cork-born architect is entitled to limited declarations concerning provisions of Ireland’s data retention laws. The State’s decision to seek an appeal before the Supreme Court means that the appeal of the High Court decision could be heard sometime in the next 12 months. The State is appealing Mr Justice O’Connor’s decision last month that sections of Ireland’s retention laws concerning information generated by telephones contravene both EU law. Ireland’s data retention laws provide for an indiscriminate retention regime, the Judge said. As well as being an important ruling in respect to Dwyer’s appeal against his conviction, the State had argued the action also had major implications in relation to the authorities’ ability to retain, access, and use information generated by mobile phones in the investigation of serious criminal activities. At the High Court today, Mr Justice O’Connor, after considering submissions from both sides in the case, said he was satisfied to make a single declaration in favour of Dwyer. Dwyer was entitled to a declaration that Section 6.1(a) of 2011 Communications (Retention of Data) Act, which allows data generated by mobile phone to be retained and accessed was inconsistent with Articles 7, 8 and 52.1 of the European Charter of Fundamental Rights. The judge noted that there had been much agreement between the two sides in relation to the wording of the declaration, and ruled that a stay was to be placed on the declaration. In his decision, the judge noted that Dwyer’s lawyers have stated that the declaration was sought for use as part of his pending appeal against his conviction for O’Hara’s murder and was not some wider public interest point. The judge also stated that given the matter is to be appealed, the court’s ruling should not be used as a reason for retained telephony data to be destroyed. The stay is to last until the first directions hearing of the proposed appeal. It would be a matter for the Supreme Court to decide whether the stay should be continued from that point onwards, the judge added. The judge said he also prepared to make a recommendation under the Attorney General Scheme that Dwyer legal costs be paid by the state. Dwyer, who denies killing O’Hara, claimed that data gathered from his phone, under the 2011 Act, should not have been used at his 2015 trial before the Central Criminal Court. The data, which was generated by Dwyer’s work phone, placed the phone at specific places at particular times and dates. That data was used to link Dwyer to another mobile phone which the prosecution told the jury during his trial that he acquired and used to contact O’Hara, with whom he had an affair. The use of the data, Dwyer claimed, was unconstitutional and breached his rights under the EU Charter and the European Convention on Human Rights, including his right to privacy. Dwyer’s lawyers argued the Act was introduced to give effect to a 2006 EU directive concerning the retention and use of data. The European Court of Justice (ECJ) found in 2014 that the directive was invalid and that position was further strengthened in subsequent rulings by that court in 2016. He claimed the 2011 Act suffered from the same flaws identified by the ECJ. The State opposed his arguments and said Dwyer’s application was misconceived and should be dismissed. It argued the laws that allow the authorities to access and utilise retained data, are extremely important in the detection, prevention and investigation of serious crime. In what was a detailed and lengthy judgement, Mr Justice O’Connor said he was satisfied that the 2011 Act provides for an indiscriminate retention regime. The ECJ, the judge said, had found that such regimes are prohibited under articles of the European Charter. The judge also found that practices of how gardaí apply for and obtain mobile phone data were not enough to satisfy the decisions of the European Courts in regards to access. The sections of the 2011 Act concerning access to retained data contravene EU law and the European Court of Human Rights because there was no prior review by a court of administrative authority for access to telephony data. Email “State to appeal High Court ruling on Graham Dwyer's phone data”. Feedback on “State to appeal High Court ruling on Graham Dwyer's phone data”.